Because your garden soil compacts too easily and can harbor organisms that may cause diseases it’s a better choice to purchase a prepared seed starting mix. A good commercial seed starting mix is often a blend of peat moss, vermiculite, and perlite. I like to thoroughly combine the seed starting mix with warm water to make it usable since a dry mix is difficult to work with. You may want to let your seed starting mix sit wet overnight before using to assure that it is evenly soaked. The final product should be evenly dampened but not soggy wet. 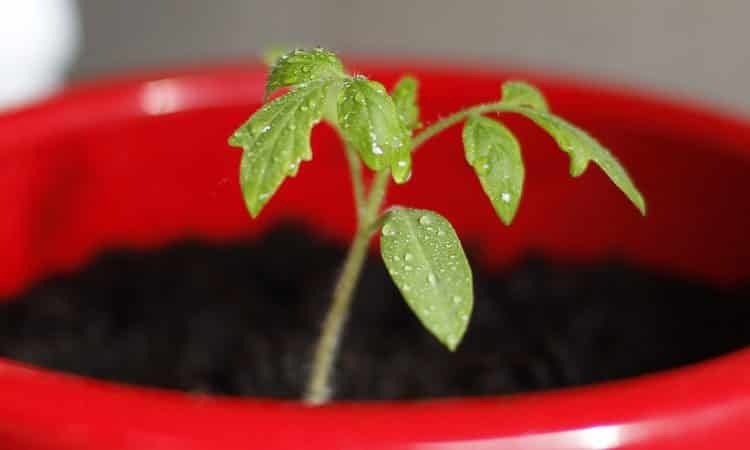 As long as your tomato seeds get sufficient moisture, warmth and drainage almost any container will work. I used to use styrofoam cups with holes punched in the bottom. I’ve found that commercially available seed starting kits with peat or plastic containers are easy to use and proven successful. Most gardening stores will carry seed starting containers with single or multiple cells. I now use commercially available 128 cell seed trays. Your choice of the container that will best fit your needs depends upon how many plants you wish to start. Avoid planting too early to prevent plants from becoming root-bound or spindly. Sow your certified tomato seeds 6-8 weeks before planting your seedlings outdoors. Planting your seedlings outdoors should be scheduled around 2 weeks following the average last frost date for your region. Check the climate zone map on TomatoFest or ask your local nursery, or gardening friends for the best date for you to plant. I advise planting 20% more seeds than the number of plants you’ll want to allow for seeds that may not germinate or seedlings that become damaged. It’s generally pretty easy to find a home for seedlings you won’t be using. Fill the container with dampened seed starting mix. Tamp downmix to get air out. Plant your seeds a maximum of 1/4 inch deep. Then tamp downmix again lightly. Dampen soil mix thoroughly with a gentle drizzling of water. Put your containers or tray into a loose-fitting plastic bag (leaving the end open for circulation. Some air circulation is good but don’t let the mix dry out because dry seeds won’t germinate. This is the hard part. Be patient. Place your containers in a warm location out of direct sunlight. Light is ok, but not needed during the germination process. If the temperature is kept consistently and sufficiently warm, your tomato seeds will usually germinate within 5 to 10 days. Best to keep temperature range 70 to 80F (21 to 27C). The lower the temperature the slower the germination. However, temperatures below 50F (10C) or above 95F (35C) are poor for germination. (Some varieties need more time to germinate.) When seeds start coming up remove the tray from a plastic bag. Watch for the first seedlings, because they will need to be moved into a good light source as soon as they begin to emerge from the soil. If the light is not adequate, you will get long, leggy stems shooting up which is not good. Many home gardeners use windowsills. The light your seedlings receive on a windowsill may be adequate but most often is insufficient and may lead to leggy growth as a result of seedlings stretching for sunlight. If you have no other light source than a windowsill, turn your seedlings regularly. For ideal growth, set up full spectrum grow lights or white fluorescent lights just a few inches above the seedlings. Be creative to find a way to get your seedlings directly under the lights. Remember, strong light is needed to support tomato growth. Your lights should stay on for 14 to 16 hours per day.